The title says it all. Life, on the Line: A Chef’s Story of Chasing Greatness, Facing Death, and Redefining the Way We Eat by Grant Achatz and Nick Kokonas is really a book in three parts. It’s the memoir of an ambitious kid who worked his way from his parents’ diner to The French Laundry to breaking out on his own. It’s also the tale of Alinea – one of the best restaurants in the country – complete with the nitty gritty details of what it really takes to build a restaurant from scratch. Finally, the book is about a personal battle with cancer, as well as a chef’s struggle with losing his sense of taste. Life, on the Line is a story of perseverance, determination, and excellence. In case you couldn’t tell, I liked this book. A lot. Most chef memoirs that I’ve read lately follow the chef as he or she moves from restaurant to restaurant, sometimes dabbling in food television or catering. Usually they focus on the amount of blood, sweat, and tears it takes to stand in front of a hot stove day in and out, and emphasize that while it may look glamorous, you, dear reader, probably couldn’t handle it. Many end in the author realizing it’s not for them either, but boy are they glad they tried. Life, on the Line is different. This is a book that is written by an incredibly successful chef and his business partner who are both passionate about what they do and have no intention of slowing down any time soon. Although you understand the amount of work that goes into running a restaurant, it’s because they demonstrate it rather than wear it like some kind of badge. This is partially because this isn’t a book for the Food Network junky new wave foodie crowd who take photos of their food at restaurants. This is a book for restaurant professionals, people in the know who will understand that this isn’t just a personal memoir, but rather a collective one. Yes, it chronicles the lives of Achatz and Kokonas, but in doing so it also provides a snapshot into a generation of chefs who are now breaking out on their own and rising to the top of the field. It’s an homage to America as an amazing food country with restaurants on par with (or well above) the Michelin-starred old school kitchens of Europe. And it’s the memoir of a restaurant, complete with architectural conundrums and investor updates. I’m not saying you won’t enjoy this if you don’t recognize all the names that Achatz works with and meets throughout his career – Charlie Trotter, Thomas Keller, Daniel Patterson, John Frasier, Richard Blais, Ferran Adria, Wylie Dufresne, Paul Kahan, Suzanne Goin, Michael Schlow, René Redzepi, Michael Carlson, Curtis Duffy, Jordan Kahn, Alex Stupak, and so on – but you may miss out on a certain layer of understanding, which is how all these chefs fit into modern culinary history. And while I found the chapters on opening Alinea fascinating (from hunting for the perfect space to passing safety and health inspections), your average Joe may not. But the fact that I peeled through this book in a single day says something about its readability and prose. The first third of the book is written by Achatz. Kokanis begins piping up when he meets Achatz in the timeline and they go into business together. The switching between voices flows and occurs naturally, providing interesting alternate viewpoints on everything from the business of the restaurant to Achatz’s cancer. 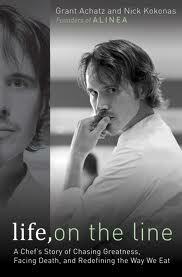 And Achatz’s story is an incredible one. When he was diagnosed with stage four tongue cancer, some of the best doctors in New York and Chicago told him that the only course of action was to remove the tongue and replace it with tissue from other body parts. He would never taste again and even then survival chances were not great. He refused, despite what experts and friends urged. After an article came out about his cancer he was approached by a doctor doing a clinical trial that would place chemo therapy first and would remove the tongue only as a last resort. 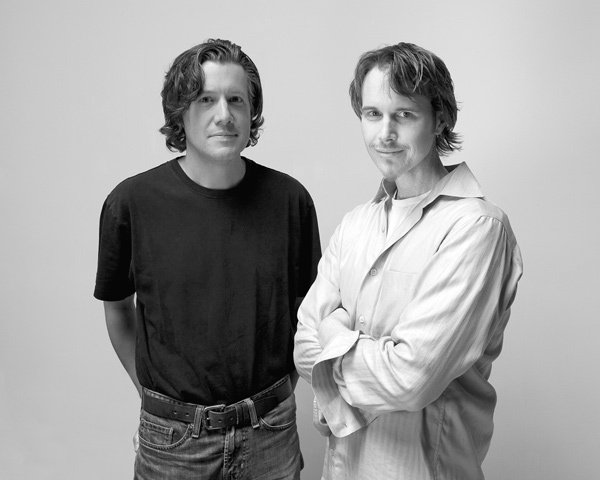 Despite pain, discomfort, hair loss, and weakness – not to mention temporarily losing his sense of taste – Achatz worked through most of his chemo and radiation on the line at Alinea. If that doesn’t motivate and inspire you then I don’t know what will. My former workplace is also mentioned in the book. A few times. I should have expected it since that is how Achatz met his girlfriend, but somehow reading about my old bosses caught me by surprise. A strange sensation indeed, to be so far away and have this bizarre looking glass into an aspect of my past life in New York. I give props to Achatz for being so, er, diplomatic. If you are looking for tales of kitchen nightmares, late night drinking sessions, sexism in the kitchen, or politics between the front and back of the house, then this is not the book for you. If, however, you are interested in gaining insight into the mind and career of one of the most creative chefs in America then you will not be disappointed. Life, on the Line is unpretentious and approachable, and a must read for anyone truly interested in the world of professional chefs and restaurants. Awesome. And reminds me, I’m doing a booky link party over at my site right now, in case you felt like linking this (or something about another book you’ve particularly loved this year) up to it! Hopy your holidays are going well! I am sorry to say I do not know many of the names you have mentioned and I hope not to be included in the “Food Network junky new wave foodie crowd who take photos of their food at restaurants”, because I must admit I do the latter. I have a real passion for food or rather what it represents to me as I present my family with the dishes I have prepared with love and devotion. I am very picky when I go out and I am not often impressed. I do not eat out frequently and wish not to sound presumptuous by saying that I am often not impressed, it may be that I am just not going to the right places. I also must say that your review of the book would entice anyone to want to check it out … and I will even with my limited knowledge of the great Chefs you mention. I also must finish by saying that I love reading your posts … so wonderfully written. Thanks so much for your thoughtful reply, J! I know what you mean about not always being impressed when eating out – if you’re paying top dollar in a restaurant they need to work hard for that money! I really, really enjoyed this book and hope you do too! Nice review. What always amazes me about the really good cooks is how they all know each other – and in many cases, have worked together. I know that’s how the biz works – early in their careers most chefs want to work in a bunch of different places to learn new techniques and approaches – but it’s one of the few businesses where this is not only common, but expected. Anyway, thanks! Thanks! It’s so true, and it’s really interesting to look back at who worked together and under whom. Often there is a time and place at a restaurant that produces the next generation of successful chefs. All very interesting to observe! Thanks for this review! I’m not familiar with the names but your description of the book makes me want to read it. It’s been added to my book list. Have a very Happy New Year! Thanks MJ! I think the book will be interesting even if you don’t know all the chefs mentioned. It’s one of those things that just adds another layer of interest. I hope you enjoy it! Happy new year to you too!